I mean, wow. From now on if there’s a hot Asian chick strolling through a palm tree strewn path on my menu, heck, on anything, I’m automatically assuming there is magic contained within. Thankfully, opening up the laminated and ring-bound menu I found a bevy of choice before me, all of it looking absolutely delicious. But whilst my friends pored over the menu and agonised over their choices (“Chargrilled goat? 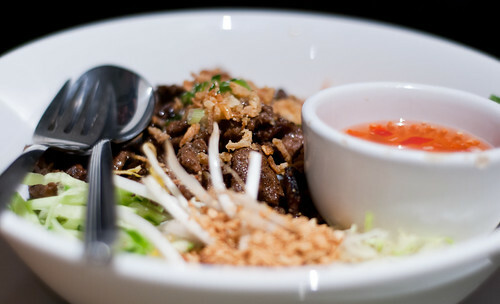 Well, that’s just chargrilled goat”) I knew that all I needed was a giant, steaming bowl of pho. Beef and brisket, to be precise. 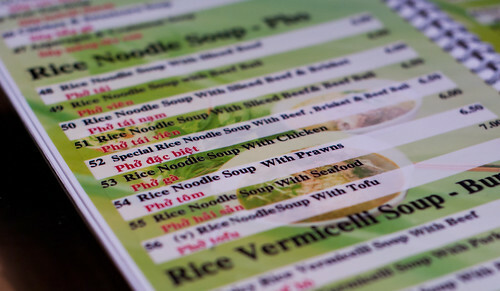 For those of you who don’t know, pho, pronounced /fuh/, is a bowl of rice noodles in an incredibly complex broth. The broth is usually made with either a beef or chicken base, boiled for hours and hours, and has a gazillion different spices in it. 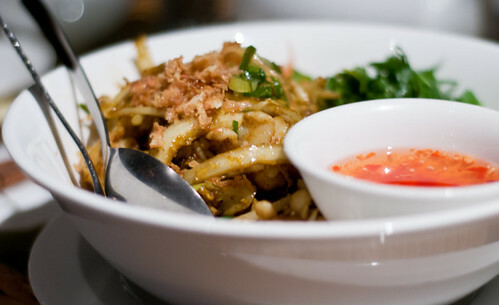 It’s often served with a side dish containing chilli, beansprouts, Thai basil, lime and fish sauce (‘nam pla’) which the diner can then include in their bowl at will, creating their very own pho. 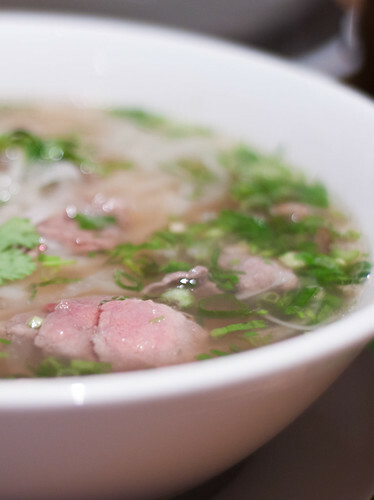 The actual origins of pho are, like the broth, complicated and complex. Some say there are French influences, some that there are Chinese, but most will agree that wherever it came from it’s pretty damn tasty. We started with drinks (I just have to say that ordering with this group of friends is hilarious – nobody ever knows what they want! Especially Emma who is super indecisive. I practically end up ordering for her every time!) 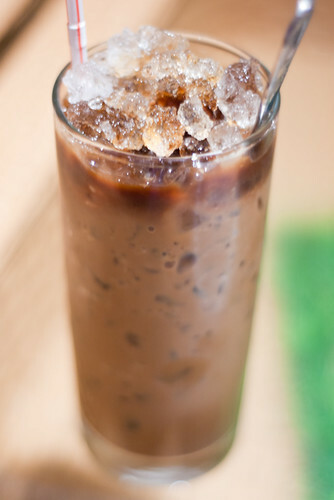 – mine a Vietnamese iced coffee (a must have in any Vietnamese joint). Then came the starters – Vietnamese spring rolls, stuffed with vermicelli noodles, minced pork and mixed vegetables, wrapped in rice paper and deep-fried. 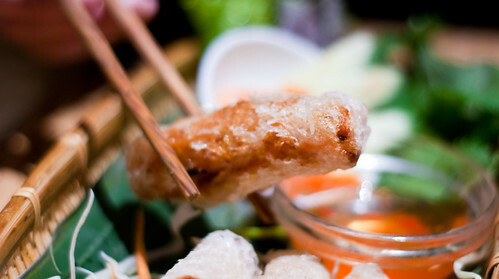 These were, possibly, the best Vietnamese spring rolls I’ve had in London. They were just so delicious – they didn’t just taste like deep-fried food, they had their own flavour, and that’s hard to do when you throw something into hot oil. They were served alongside mint, burdock leaf and a few pickled cucumber and carrot slices for you to wrap the spring rolls in if you wanted to (which Sam and I did, but didn’t tell the others, as we forgot that they didn’t know you could do that – “it’s an Asian thing”). Everyone else’s food arrived, Sam had gone for a rice noodle and goat dish; Richelle for a rice noodle and seafood dish; Rick for a rice noodle and beef dish, Emma for the goat with lemongrass and chilli with rice (not pictured); and Naomi and I for the pho with beef and brisket (on my recommendation). And then the pho arrived. This picture honestly does not do my pho justice. I should’ve taken a photo of it as I lifted those gloriously chewy noodles out of the absolutely mind-blowing broth and succulent pieces of meat and took my first bite. But I didn’t. Because first bite led to second bite, which led to me practically swallowing down the whole bowl, plus broth, plus garnish, plus chopsticks. It was that good. In fact, the others all had pho envy, and were dipping their spoons into my bowl to try the broth, then bemoaning their own choices (which were, in actual fact, also very, very good). Richelle was so jealous of my pho that she went home, demanded that her Vietnamese friend make her pho, and has now actually convinced her friends to have their Christmas meal at Mien Tay next week, just so that she can have a whole bowl of pho to herself. That’s dedication. That’s also pretty much how I felt after I had my first ever pho. We wolfed down our meals, made silly jokes at each other’s expense, Sam and I tried to explain what ‘jook’ (congee) and ‘pork floss’ were to the others (it’s pretty much what it sounds like: pork candy floss. Don’t judge me, trust me – it’s amazeballs), and at one point Emma, keen to demonstrate what police dogs sound like when they detect cocaine on you (don’t ask), started barking in my ear. I was laughing so hard my sides hurt; I’m pretty sure Rick, the only male at the table, was desperately looking for a way out/to seem as if he wasn’t with us, but that was hard since he was trapped in the corner… and is married to Sam. Service was fast, the waiters and waitresses, whilst not exactly ‘friendly’ were more than polite and efficient, and the food was simply wonderful. But do you know what the best thing about all of this was? Not just the food, not just the company, but the fact that the final bill came to £10/head (not including alcohol). That is ridiculously good value, because our bowls were huge. We could barely finish it all (well, not me, but I think you may have already gathered that…)! When we finally left the restaurant it was snowing again outside, which touched even the heart of a scrooge like me. Maybe it was because I’d laughed myself silly, maybe it was because I was a little giddy with social interaction (it can get a little lonely working all by myself across town), but I think it was mostly down to that big ol’ bowl of pho. A good pho can do wonders for the soul. This would’ve been my 9th entry for Project Food Blog. The other eleven eliminated contestants and I decided to post our reviews or retrospectives, please do check them out! They’re a fantastic bunch of food bloggers whom I’m proud to be a part of. Jackie: you know what amazeball things I think about you!!! Your friends are very lucky to have someone like you with which to laugh themselves silly. This review is very “you”. I love that you have stayed true to your style and self throughout pfb. Loved every post. I look forward to our continued friendship! I will always look for hot Asian chicks on my menus (though that still won’t convert me). Eric and I love Pho and go out on these brutally cold days. There’s nothing better when you are beginning to get sick… this will knock it right out of your system. Chicken soup on crack, I’d say. My mouth is watering! Vietnamese! Mmmmmmmm! Glad you your meal was great! Jax, this is a very entertaining and balanced review, though I still can’t figure out how you knit willies into a text message…. That pho sounds amazeballs. Seriously. I love the broth because I just looooove any kind of hot, flavourful soup! I’m sorry you didn’t make it to round 9 – but I think it’s so great that you all published together, too! Excellent review! I’m now craving a big bowl of noodles. It’s only 9am, too early for lunch? 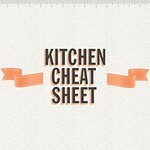 I enjoyed all of your PFB posts, and I’m so happy to have discovered your blog! Looking forward to reading your blog regularly! 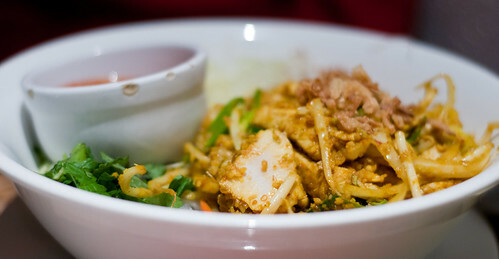 So, I haven’t had pho :( So bad of me, because I think we have a pretty good representation of vietnamese food in SD. I’ve got to have it! Ash: when I’m in SD we’re going. No arguments.